"A bite of history a day, all year long . . ."
Flawless storytelling, expert research, and intriguing, one-page essays make The Seven-Day Scholar: The Presidents perfect for history buffs. 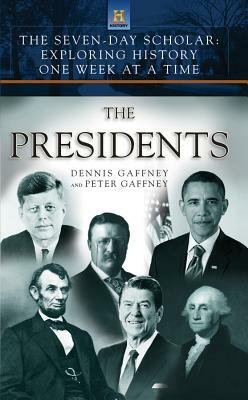 The Presidents addresses formative moments in the lives of the presidents, crucial political decisions, little-known facts, and insights into the intriguing individuals Americans have selected to lead our country. Each chapter includes seven related narrative entries-one for each day of the week. The book explores many fascinating facts and issues about the presidents, including: Did Washington really enjoy dancing? Why did President Jefferson avoid speaking in public? Why did Lincoln crack down on civil liberties? Why did Eisenhower fight against big defense budgets? How responsible was Reagan for the end of the Cold War? As well as covering each president, the book includes chapters on the Best and Worst Writers and Speakers; Most Controversial Elections; Scandals; Most Controversial Foreign Policy Decisions; The Peacemakers; First Ladies; The Best and Worst Presidents; and more. Entries also include follow-up resources where curious readers can learn more. Readers can sweep through the book from beginning to end, or use it as a reference book, periodically exploring topics and presidents in which they are interested. Dennis Gaffney is an adjunct professor at the University at Albany SUNY, and also a journalist who has written for The New York Times, Mother Jones, and Reader's Digest. Peter Gaffney is Senior VP, Programming, Scheduling and Acquisitions for HISTORY.